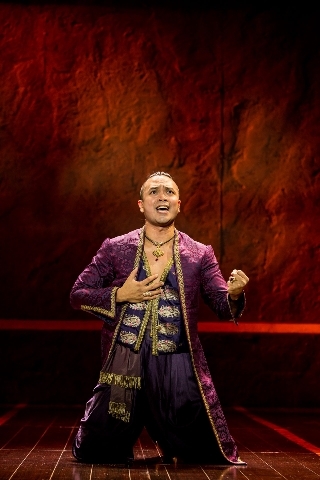 “The King and I,” to borrow King Mongkut’s words, is a puzzlement. How can two people who’ve irritated each other so much, with seemingly have nothing in common, have such a profound effect on each other? 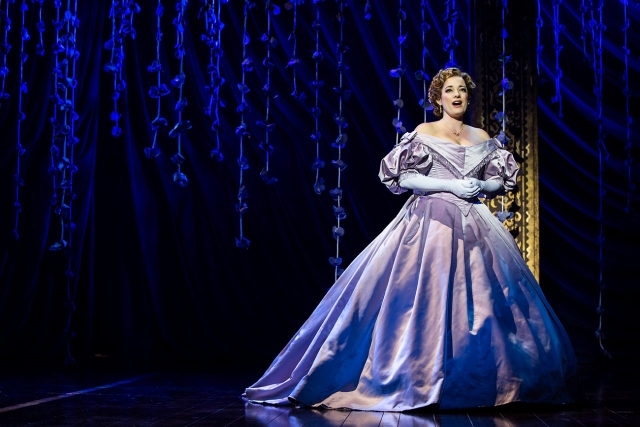 That surprisingly strong, life-changing factor is at the heart of Richard Rodgers and Oscar Hammerstein II’s classic musical. It is based on the novel “Anna and the King of Siam” and set in 1860s Siam (Thailand today). These days, nowhere is the musical’s core more evident than in a theater in which the 2015 Lincoln Center Theater production is producing laughter, tears, shock and wonder. A national equity tour of the production is docked at Miami’s Adrienne Arsht Center through Sunday, May 14. This production of the beloved musical about a king wishing to modernize his authoritarian regime, while having trouble changing the way he’s used to ruling, deeply stirs in us practically all the emotions of the human experience. It's also a visually enthralling production, featuring an expansive set by Michael Yeargan. It includes an authentic-looking ship ferrying Anna and her young son, Louis (a spirited, if a bit awkward Graham Montgomery), to Siam. But perhaps the production’s ability to zero in on the show’s core earned this revival four Tony Awards, including Best Musical Revival. At the end of this lavish production, complete with an authentic-looking ship, we keenly feel the impact the main characters have had on each other. At one point, the king is about to severely whip a runaway slave who’d been found by the “secret police.” She is a young woman given as a “gift” to his majesty (a superb Jose Llana). He brings the whip back, but can’t bring himself to lash the slave girl, Tuptim (a sensitive and delicate Manna Nichols). It’s as though the king’s arm is locked in place. He flinches, as though he were just blindsided by a one-two punch, and runs off with emotional pain and humiliation etched on his face. Soon after, Llana’s king is resting on his deathbed. What happened to the tempestuous, vigorous ruler we’ve witnessed for the past two-and-a-half or so hours? Did he, in the instant that he couldn’t bring forth that whip, suddenly realize the errors of his authoritarian ways and succumb to a broken heart? Even if he did, it's a bit of a stretch to believe he could suddenly grow that sick as a result of Anna's pleading with him not to whip Tuptim. If the king's heart was shattered, his wasn’t the only one. We listen as Anna emotionally tells her son that she loves the king, as he’s about to die. It sounds as though we’re hearing the voice of a woman whose caring, loving husband of many years is dying. That’s hardly an apt description of the king, played with an authoritative, commanding, even fear- inducing air by Llana. At times, Llana’s king comes across as someone so proud and nasty that there’s no way we can sympathize with such an individual. But Llana imbues the royal man with enough open-mindedness, lovable naiveté, curiosity, thoughtfulness and competitiveness in a mischievous, playful kind of manner that he doesn’t come across as a barbarian, as he fears a British envoy views him. 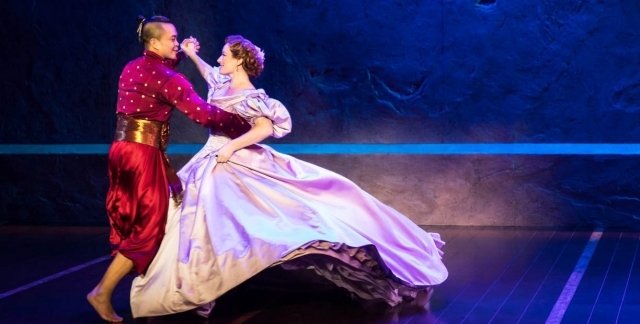 “The King and I” can provoke us to think and discuss topics such as imperialism in the era of Donald Trump. Director Bartlett Sher mines the king for all the nuance and humor he can milk out of him, eliciting hearty, well-deserved laughs and making the king likable, despite his severity. As much as we may think Anna and the king have nothing in common, their personalities are strikingly similar. For all of Anna’s good qualities, she can be, self-centered, petty and strong-willed. Perhaps the similar personalities of Anna and the king attract them to each other. That attraction should manifest itself slowly and subtly and it does so for much of the production. The result is we root for this hesitant couple to grow ever closer. The closest they come to embracing is during the upbeat “Shall We Dance” number, performed vivaciously. The king seemingly loses all his inhibitions, eager to learn about the courting ways of young men and women of the western world. A similarly upbeat, tender aura exists when Anna begins teaching the king’s many children, which segues into “Getting to Know You,” sung with love and tenderness by Kelly, who has a sweet voice and finds Anna’s soft side along with her assertiveness. She could, however, be much more forceful in her soliloquy song “Shall I Tell You What I think of You,” which allows Anna to vent her frustrations at the king, his backwards views of women and his general stubbornness. Llana, who possesses a strong, expressive singing voice, shows it off in his musical soliloquy “A Puzzlement,” during which the king expresses his frustration about how the world has changed and lack of certainty about different topics. As he sings, Llana paces in confusion and exasperation, as though he’s trapped. There’s no sense of claustrophobia in Yeargan’s set, whose stately, roomy depiction of the palace comes complete with chandeliers, tall columns and a high fence. The set gives the actors plenty of room to maneuver and perform. Christopher Gattelli’s vibrant choreography is based on the original choreography by Jerome Robbins. Of particular note is the narrative ballet-within-the play, “The Small House of Uncle Thomas,” executed with flair and with a distinctly Asian flavor. It is enhanced by Donald Holder’s intense lighting, which is mood-appropriate throughout the production. The aura is somber, sad and heartfelt at the end. You’ll need tissues. One of the king’s youngest daughters tells Anna in a small, sweet voice how much Anna has meant to her. If you wonder what has kept Anna from leaving Siam with each insult or degradation of women spewing from the king’s mouth, you’d have to say it was Anna’s love for his children. You could say this about Anna, the king and members of the royal family. This is especially true for the king’s son, Prince Chulalongkorn (a vulnerable, frightened Anthony Chan, as he will succeed his father as king). Kudos to head wife Lady Thiang (a loyal, patient Joan Almedilla, who is stern and commanding when necessary). Because Anna and members of the royal family's paths crossed, their lives were changed for the better. Details concerning the national tour of this production are available at http://thekinganditour.com.